Price: 1 lb. 1-1/4 lb. 1-1/2 lb. 2 lb. Lobster Gram for 2: Pick your Lobster! Lobster Gram's namesake package and top seller is the perfect gift for the lobster purist - sweet, succulent live Maine lobsters will tantalize the taste buds, while the accessories make enjoying this classic feast a snap. Meal serves 2. Boiling: We’ve taken the time to speak with hundreds of lobstermen and chefs, all of whom agree that boiling is the easiest, and often the best, method for preparing live lobster. Let us walk you through your experience with step-by-step instructions for optimal, and delicious results. DIRECTIONS: Keeping the lobsters in the provided cooler, fill the appropriately-sized pot (see below) with enough water to cover the lobsters and cooler. Place the water-filled pot atop the stove and bring to a strong boil. Adding salt to accelerate boiling is not recommended: it may result in an over-boiled lobster. Firmly grasp the lobsters behind their arms and carefully plunge them head-first into the boiling water. Some people prefer to cut off the rubber bands, making the case that the rubber affects the taste, but this is optional. If you decide to remove them, be careful, those claws can hurt! Cover the pot with a lid. You may hear a whistling sound as the air begins to escape from the shells. Be mindful of splashing water and any over-boil. When the water returns to a full boil, set a timer for the appropriate cooking time (see below). Continue cooking uncovered and reduce heat as necessary to maintain a soft boil. While the lobster cooks, prepare lemon/butter sauce. Simply melt butter over very low heat and, if you’d like, add lemon sliced in quarters. Make sure you try some lobster without any butter or lemon first, though! As your cooking timer expires, your lobsters should be deep red to pink in color. Be sure to wear rubber kitchen gloves or appropriate protection when handling to prevent burns. Carefully remove your lobsters from the pot with tongs or other utensils, and place them on a plate. Let them sit for a few minutes so that the juices can soak into the meat. 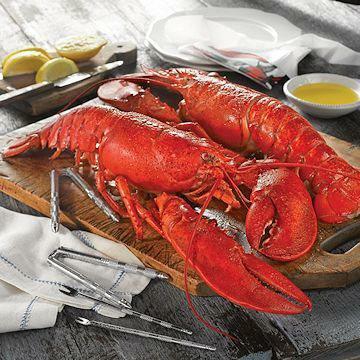 Maine (Northern Atlantic) Lobster: (145g (1 cup) calories 142, calories from fat 8, total fat 1g, saturated fat 0g, trans fat 0g, cholesterol 104mg, sodium 551mg, total carbohydrate 2g, dietary fiber 0g, sugars 0g, protein 30g, vitamin a 3%, vitamin c 0%, calcium 9%, iron 3%. Wild caught, product of USA & Canada.